31 Oct WHAT KIND OF ROOFING IS BEST FOR YOU? 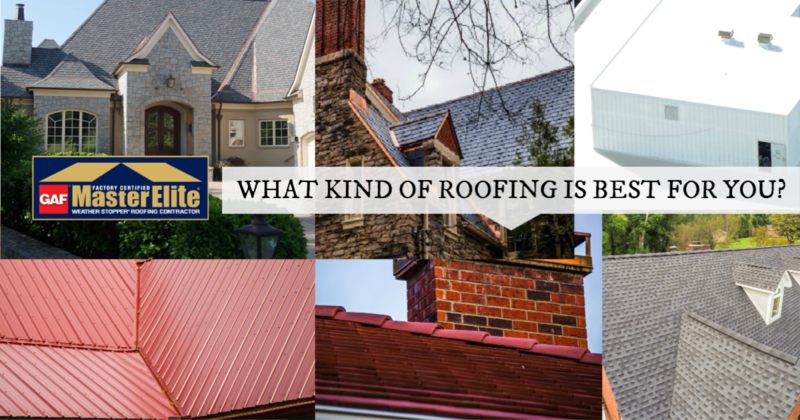 What kind of roofing is best for your? Roofing materials today come in a wide range of colors, materials, sizes, and overall appearance. From natural slate roofing to a man made shingle that mimics the appearance, or perhaps a standing seam metal roof or a metal tile roof! The options and almost limitless. So what kind of roofing is best for your home? WE HELP YOU FIND THE BEST ROOFING OPTIONS! Our project managers will work with you to determine the answer to this question which can be complicated! The first and possibly most important fact to consider is your budget! While a natural slate roof is certainly beautiful and offers more than a lifetime of durability, the cost make make it prohibitive to your specific budget, or may simply to expensive based on the appraised value of your home. A ROOF THAT FITS EVERY STYLE HOME! Another factor to consider is the style of your home. A standing seam metal roof is extremely durable and energy efficient as well. It can look quite stunning on a home or business and provide a clean industrial look or a farm-house style appearance. But, if you have a traditional brick ranch home, this may not be the overall look that you wish to achieve with your new roof. Metal tiles are another options to metal roofing that many people find extremely attractive and give more of a cottage type feel compared to the industrial or farm-house theme. Composite shingles are historically what people think of for residential roofing and range from a 3-tab to the architectural shingle and ultimate the designer shingles which are made to mimic wood, slate or unique dimensions. This is the most affordable type of roofing system available and is extremely popular. With an affordable upgrade to the more unique designer shingles, your home can really stand out while providing exceptional protection for your interior. Will my existing framing support the roof of my dream? What type of roofing is recommended for the pitch of my home? Does it go with the style of my home and add rather than take away from appearance? Is it acceptable by my HOA or local building codes? What is the expected lifespan for this roof? Does the cost, or investment, make sense for the market value of my home? Will it fit within my budget? NASHVILLE’S TOP RATED ROOFING COMPANY! There are so many things to consider when trying to determine What Kind of Roofing Is Best For You! That is why is it so important to work with a knowledgeable and experienced roofing company whose staff can help guide you through these decisions. No matter what type and style of replacement roof you select, it is critical that it be properly installed and meet current building code and manufacturer requirements. You can trust MidSouth Construction to install a top quality roofing system that will provide you will years or low maintenance protection for your home! We are Nashville’s top rated roofing company for all types of roofing! What Kind of Roofing Is Right For You? What kind of roofing is right for you written by Nashville's top roofing contractors, MidSouth Construction. It discusses the many options today in roofing products and how to fit one that fits your style and budget.